The traditional wired doorbell has been a constant feature in homes for decades, and for some, this tradition remains. However, there are some homes that now make use of video doorbells to enhance the security of their front doors and improve their overall security. These wireless automated doorbell systems are becoming increasingly popular because of how easy they are to use, and because they increase the convenience that is afforded to homeowners. Automated doorbells have helped many homeowners increase the strength of their home security, and this is a major part of the reason why they are continuing to grow in popularity. They look futuristic, and they are futuristic. Automated doorbells have made an integral, yet mundane, aspect of the home exciting again. They are among some of the most recent additions to smart homes in the past few years, and they work well with other smart home gadgets like smart locks and surveillance systems. Let’s take a look at some automated doorbells that are changing the state of home security. The Skybell Wi-Fi Video Doorbell is definitely a hit among many homeowners. The doorbell boasts a sleek, circular design that will definitely make the entrance of any home look futuristic. This doorbell was designed to take the functionality of a traditional doorbell a step further, by essentially working to notify homeowners faster. The Skybell video doorbell gives homeowners the luxury of having HD video output, as well as live video monitoring capabilities. The video doorbell also has motion sensors that allow it to notify homeowners even as someone is approaching the door. The Skybell also has a mobile application that allows its homeowners to control the device remotely, and to either access its video feed or answer the door. The doorbell aims to redefine home security and it does so by providing homeowners with a doorbell that also functions as an intercom and a security camera. This doorbell can also be integrated with other smart home products, which will help homeowners have even more control over their homes than they did by using each device separately. In addition to everything listed above, the Skybell video doorbell is extremely weather resistant (functions perfectly between -40 to 150º F). The device also has exceptional night vision capabilities that allow users to see perfectly in the dark. The 120º angle of the camera provides users with a wide view and helps them see more than just the front of their door. It is also important for homeowners, who make use of these video doorbells with surveillance capabilities, to understand how surveillance cameras can be used. The Ring Video Doorbell is another favorite among homeowners. This doorbell was originally debuted as the Doorbot. The Ring doorbell continues to do all the good things that the Doorbot did while adding a host of features that make it even better than its predecessor. The Ring Video doorbell aims to make sure homeowners always have access to their homes, no matter where they are in the world. This doorbell is supremely easy to install, probably easier than some do-it-yourself security cameras and will work well with the existing wiring that was in place for your old doorbell. The doorbell can be connected to the homeowner’s Wi-Fi network and remotely accessed through the mobile application. The doorbell is equipped with a camera that features wide angled HD video, as well as motion detection features that work together to provide maximum security. Due to the connectivity between the doorbell and the homeowner, via the mobile app, it becomes nearly impossible for a homeowner to miss anything that is going on outside of their home. The Ring doorbell is easy to install and even novice DIY homeowners will be able to accomplish this without breaking a sweat. The Ring doorbell is also one of the few doorbells that are able to integrate with other smart home devices, and it works well on several different mobile platforms. The Zmodo Greet is another smart automated doorbell that has homeowners excited for the ever-increasing possibilities of smart homes. The Zmodo Greet has a functional design that will blend in with any home. However, it is what lies underneath that is really noteworthy. This doorbell is equipped with an HD camera, infrared LED’s, motion sensors, microphones and a two-way speaker, which all work to keep the homeowner more connected to their doorbell than ever before. The features of the Greet make it an exceptional doorbell, as well as an additional security device. The light sensor on the doorbell allows for automatic night vision, and the motion detection system prompts the doorbell to start recording as soon as motion is detected. The Zmodo Greet also has 8GB of internal storage that allows it to keep video footage on hand and accessible by homeowners. In addition to all these features, the Greet allows homeowners to have more than one designated user controlling the doorbell. This ensures that multiple users can receive notifications and alerts from the doorbell. Also, the Zmodo is easy to install, and it can be done by even the most DIY shy homeowner. In many cases, it will work fine with the wiring that was in place for the previous doorbell. The Vivint Doorbell Camera is probably the smallest product that the Vivint Smart Home team has presented to consumers. However, do not let its size fool you, the doorbell camera is full of cool tricks and features that will make it a worthwhile purchase for any homeowner. The inconspicuous doorbell will fit right in with any exterior home design. It will help you monitor everything that goes on in the front of your house, while also letting you answer the door remotely, talk to visitors, and constantly monitor the state of your home’s exterior. 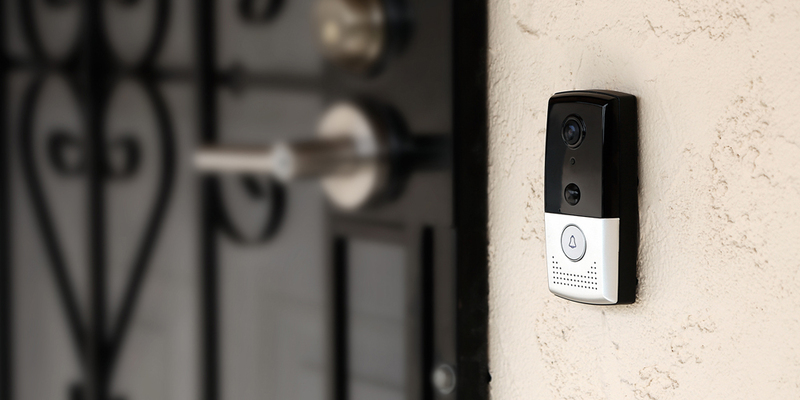 To make the camera even more appealing to homeowners, it looks like a regular doorbell, just a little more futuristic. This doorbell camera provides high definition video output, a two-way speaker system, and a host of add-ons that make it fit into any smart home. The doorbell can be easily integrated with other aspects of a smart home. For instance, the doorbell can work hand in hand with your smart lock or with a monitored security system. This allows homeowners to have complete and seamless control over their smart homes since all their devices are working together to keep them safe. The only thing that makes homeowners hesitant about the Vivint Doorbell camera is its price. In comparison to some of the other automated doorbells on the market, the Vivint Doorbell Camera is rather steep. However, the trade off is the fact that your home security will have a few extra eyes on it, and your doorbell will also have some good, durable equipment. When people hear the word ‘August’ and ‘Smart Home’ together, they naturally assume that the conversation will be about the August Smart Lock. Today, however, the conversation is about the smart lock’s cousin, the August Doorbell Cam. The August Doorbell Cam attempts to walk in the footsteps of the smart lock with its innovative design and with the features that it has packed into it. The August Doorbell Cam looks sleek and futuristic, with a square, sharp edged design that makes it stand out from its competitors. The doorbell cam gives homeowners remote control over their doorbells, while also ensuring their privacy through the use of a one-way HD camera. This allows users to clearly see who is at their door while ensuring that the visitor has no way of seeing anything that occurs in your home. In addition to these features, the doorbell camera also utilizes motion detection technology to alert homeowners when there is anyone close to the entrance. The person does not necessarily have to ring the doorbell, but the August Doorbell Cam will still send a push notification to the homeowner. This will allow for faster reaction times for cases when said visitor has malicious intent. The August Doorbell Cam is high above most of the competition, but it still has some kinks that leave homeowners hesitant about getting one. For instance, the unique square design (which looks really awesome) makes it a burden (for some homeowners) to attach the doorbell cam to the fixture where the old one used to be. This is because most traditional doorbells are either round or cylindrical, and this makes the square doorbell cam stand out like a sore thumb. There are many critics who love the features of the August Doorbell, but find fault in the limitation of the design.